The images will last forever, I am certain. The bustling narrow streets of the Old Quarter area of Hanoi, the water puppet show dating back to the 10th century, the 11th century Temple of Literature honoring scholars and men of learning, the Museum of Ethnology, the Women’s Museum in Hanoi, the War Remnants Museum in Saigon (Ho Chi Minh City), the Imperial Citadel of Hue, the lantern-lit old town of Hoi An with its charming tile-roofed wooden buildings, the ruins of the ancient Cham kingdom (Vietnam’s version of the newer but larger Angkor Wat), the French influence on Hanoi and Saigon, the site of John McCain’s imprisonment, Mausoleum of Ho Chi Minh and his humble homes, and the umpteen temples and pagodas, markets, rivers, beaches and rice paddies. But it’s the people whose images are most deeply imprinted and who will be the face of the future in this fascinating country. A child living in the heavily bombed countryside outside Hanoi during the war, whose father was killed fighting in the North Vietnamese Army, works hard at her job but makes time for a wide range of charitable activities. Her daughter is at college in the U.S. An artist whose studio is in her small home, but whose paintings have been acquired by the families of French and American presidents. A proud and tough former South Vietnamese officer, who invited us for tea in his home and showed us his creative art work that belies his painful past. A young student of history, whose farmer father lost seven of his ten siblings when a Viet Cong guerrilla fired into his Mekong Delta home on the misinformation that South Vietnamese officers were quartered there. Afterwards, the student’s father cut off his right index finger so he couldn’t shoot a gun and could avoid conscription. We found uniformly positive attitudes toward American people, especially when contrasted with negative views of China. Attitudes toward American presidents differed dramatically. Trump was widely criticized for his indifferent Danang and Hanoi appearances last year. Obama and Bill Clinton are missed. 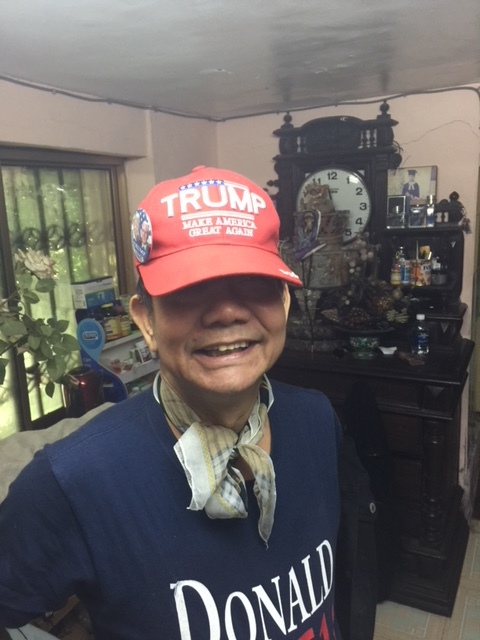 But there was one former war photographer we met in Saigon who greeted us in his tiny apartment wearing a navy Trump 2016 tee shirt and a red “Make America Great Again” cap. We thought it was a joke, but it wasn’t. 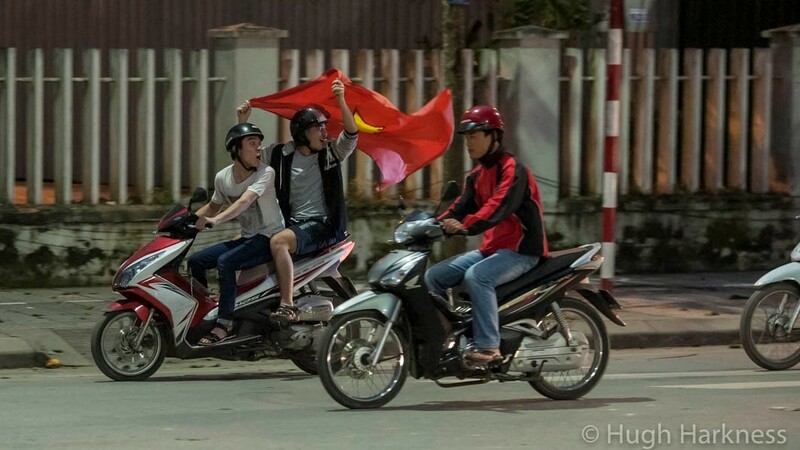 Outsiders tend to look at the Vietnamese in binary terms: Hanoi versus Saigon, Communists versus anti-communists, bad guys and good guys. 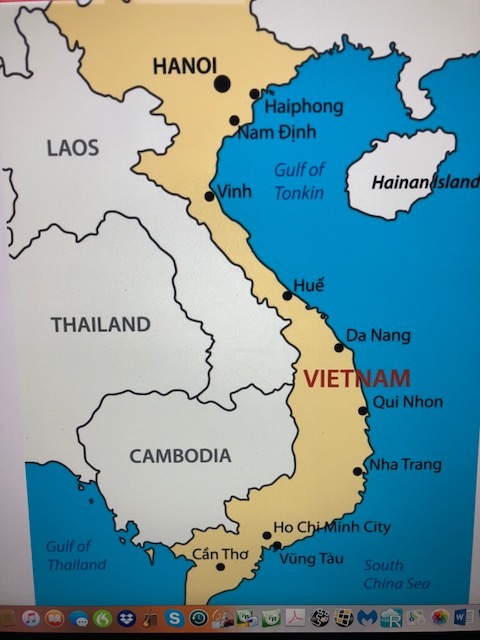 Post 1975 Vietnamese who settled in the United States have still another take. But the reality is more complex. The Vietnamese were victims of foreign aggression, for millennia by the Chinese, for more than a century by the French. (A French guillotine stands near barbed wire tiger cages in one of the war museums in mute testimony of that era’s brutality.) And then the Americans, beginning with the Truman administration. But the Vietnamese were not just victims; they were brutal to one another and also to the Laotians and Cambodians. They don’t like to discuss this aspect of their history. The economy is growing rapidly, spurred on by the privatization of formerly state-owned companies and vibrant foreign investments. South Koreans, for example, who were fighting Communism in Vietnam during the war are making large investments today. South Korean tourists are there in high numbers, along with Japanese, Chinese and Thai. There are fewer Russians, but they are still a presence. For people who traditionally shop fresh daily, super markets and frozen foods are coming; upscale shopping malls are spreading; foreign brands from Hermes to Starbucks are increasingly present. Rows of luxury condo developments marketed to foreigners are under construction on the beaches near Danang. With increased prosperity, and few if any environmental controls, has come throat-burning, eye tearing air pollution and contaminated water. With staggering new wealth and old-style corruption has come growing income inequality, with the World Bank estimating that the richest five percent of Vietnamese hold a quarter of all income. Reconciliation is an ongoing process, but what all the people we met have in common is that they are survivors. They will educate their children. They will hold down two or three jobs if necessary. They will look for economic opportunities. They seem to compartmentalize the Communist government’s refusal to share power, the constraints on freedoms of speech and press. To our questions, they smile meaningfully but turn the conversation in other directions. They shrug knowingly when asked about well-known corruption at all levels of government, but are more comfortable discussing pay-offs for promotions and other benefits common in the private sector. They go about their lives. Despite all these challenges, they are pragmatic individuals, forward-looking and optimistic. They’re easy to like and to admire. Saturday’s final was against Uzbekistan in a snowstorm in China. Snow is not the natural habitat for the heavily under-dog Vietnamese. The taller and heavier Uzbeks are used to snow. The Vietnamese persevered, and at halftime the score was 1-to-1. 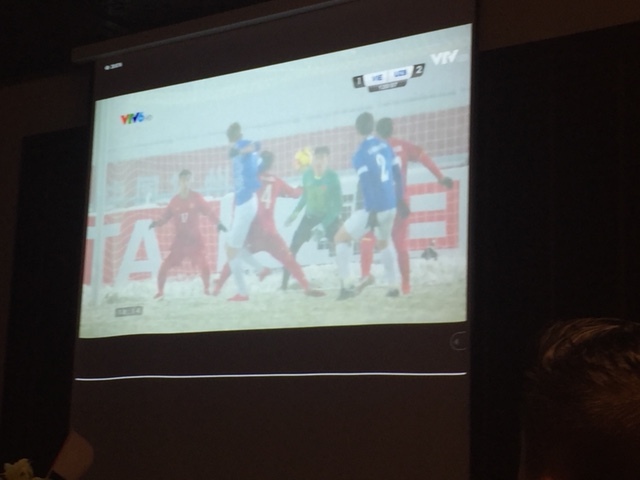 In Hoi An, we were the only non-Vietnamese watching with the staff of our hotel, rooting along with them. The score was still tied at the end of regulation time. Could they do it again? With a minute of overtime left, the Uzbeks scored, and it was over. The Vietnamese were disappointed but not crestfallen. They had done better than anyone had dared dream. 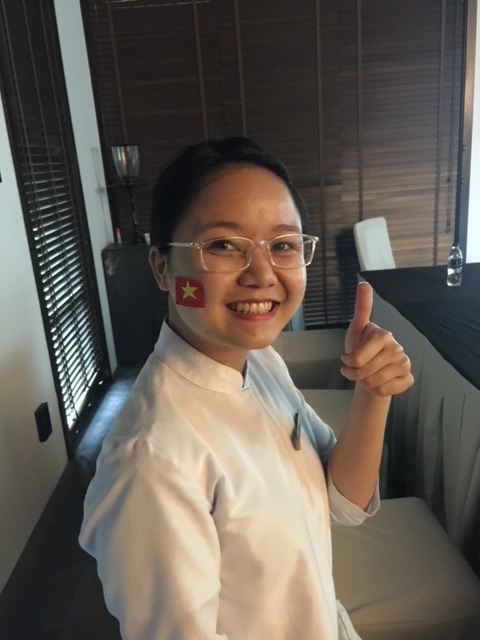 The next day, we watched storefront television sets in Saigon’s Chinatown as all Vietnam welcomed home their silver medal national team. All were proud of their achievement. They are scrappy and determined. They will be back. It is a metaphor for their future. 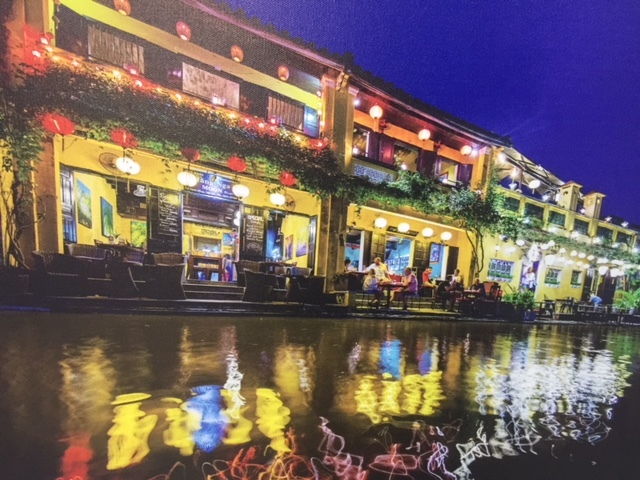 This entry was posted in Uncategorized and tagged Asian tourists in Vietnam, Communist government control in Vietnam, corruption in Vietnam, Faces of Vietnamese today, Images of Vietnam, Old and new in growing economy, reconciliation post-war Vietnam, Vietnamese press and speech restrictions. Bookmark the permalink. What an informative view. Excellent. Thank you. I love the series. They build content incrementally leading to #4 beautifully. … by the family’s of French and American presidents.